Authorities in Dharamsala have condemned increased military repression in Tawu Monastery after the self-immolation of a 29 year old monk. Chinese authorities have shown a pattern of increased military presence and violence in the aftermath of similar protests. 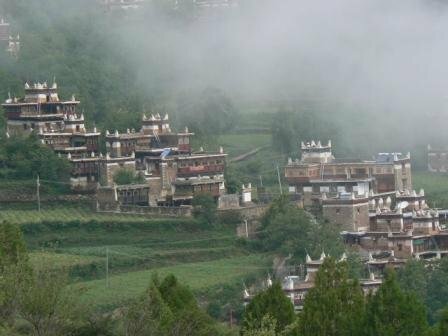 Tibetans and supporters across the world are strongly concerned over the current tense situation at the Nyatso Monastery of Tawu county in eastern Tibet. China deployed thousands of armed forces with military tanks and locked down the entire areas of the county after a 29-year old Buddhist monk's self immolation to protest against China's rule over Tibet. Five regional Tibetan NGOs in Bylakuppe, Karnataka state of South India Tuesday, 23 August  held a joint press conference to pay their homage to the late Tsewang Norbu, a 29-year old monk from Nyatso Monastery who self immolated to protest against Chinese rule in Tibet and its severe repression of the peaceful Tibetan people. "Following the event, the Chinese authorities deployed thousands of armed Chinese troops with military tanks in the areas of the monastery, locking down the entire monastery," said Tibet sources. "The Himalyan town of Tawo was locked down with blocking the roads, closing down the schools, restaurants and cafes etc. Restrictions on the movements of the local Tibetans and communications via telephone and internet have been severely tightened," said the NGOs at the press conference. "This is the third self-immolation by a Tibetan monk; the self-immolation of 20-year old Kirti monk Phuntsok on 16 March , who also called for the long life of His Holiness the Dalai Lama during his protest, was followed by a violent crackdown in the Amdo Ngaba region of eastern Tibet," the group said. "Since 6 July , there have been severe restrictions and strict vigilance of the area after the local Tibetans defied the government orders and headed by nuns of Gaden Jangchup Choeling Nunnery, they gathered in a nearby hill to celebrate the 76th birthday of His Holiness the Dalai Lama. The Chinese authorities have cut down water and electricity supply to Gaden Choeling Nunnery and Nyatso Monastery since the celebration last month," it added. The 29 year old Buddhist monk Tsewang Norbu of Nyatso Monastery in Kham Tawo, eastern Tibet self-immolated to protest against Chinese illegal occupation over Tibet and its severe repression of the Tibetans. For 10 minutes he raised slogans like 'We want Freedom in Tibet' and "Please invite my spiritual leader, His Holiness the Dalai Lama to my own country Tibet" and We want Human Rights in Tibet," while scattering leaflets with similar messages at Chume Bridge in the center of Tawo town. Later he doused himself in petrol and also drank some petrol before blazing himself up in a rare and powerful display of protest against the Chinese Government. He died soon after, according to Ven. Yama Dorjee, a friend and neighbor of the deceased monk. "The monks of the monastery were stopped from performing the last rites and rituals for the deceased monk. The Chinese authorities of the regime even ordered the swift cremation of Ven Tsewang Norbu's body barring the local populations from attending the funeral ceremony and pay their last respect to the deceased." said Ven. Yama Dorjee, who also is a member, Tawo Tibetan Association, South India. "I am deeply distraught by the death of my friend and countrymen and also seriously fear about the possible severe crackdown on the 270 monks of the Nyatso monastery following this incident. The situation is still tense in Tawo town," stressed Ven Yama Dorjee. "The ongoing widespread protests in the entire Tibet besides underscoring the critical nature of the situation in Tibet also signal the desperation Tibetans are feeling under the current political and security crackdown. It also demonstrates Chinese government's failure to impose its will on the Tibetans and it will continue to fail until it responds to their legitimate grievances," it added. "We therefore express serious concern at the plights of Tibetans in Tibet especially Kham Tawu and Amdo Ngaba etc. We also urge the international community to pressurize the Chinese Government into restoring normalcy in the region and intervene in order to improve the human rights situation of Tibet under China." The five members of the NGOs who attended were Mr. Tenzin Lodoe, Vice President, Regional Tibetan Youth Congress, Bylakuppe, Ven. Lobsang Choedup, President, Regional National Democratic Party of Tibet, Bylakuppe, Mrs, Tenzin Wangmo, President, Regional Tibetan Women's Association, Bylakuppe, Ven. Lobsang Palden, President, Tibetan Rights and Freedom Restoration Committee, Bylakuppe and Ven. Yama Dorjee, Member, Tawo Tibetan Association, South India.